G-5 is an agent with British Intelligence. That is just a guess on my part. He never expressly states it and towards the end of his recorded adventures he is referred to as an "international agent" but most of the operations we learn about have him working on behalf of or reporting to British Intelligence. He most definitely is at home in Europe which is the backdrop for all but one of his escapades and his obvious command of numerous European languages is extensive and impressive as is his ability to fit in to his surroundings when he feels the need. G-5, a man whose real name is not only never spoken but who also eschews the use of aliases, preferring to use his cover designation if a name is required, is a handsome blond haired man likely in his mid-30s based on his depiction. He is in excellent shape and is more than a match for just about everyone with whom he needs to scuffle. He is quite good at boxing and knows a thing or two about the martial arts, throwing and flipping his enemies a lot. There is no indication that G-5 has any lasting relationships, at least during the time of his activity, which is understandable since the agent gets around a great deal, surprising considering the state of hostilities around him. With such a wide range of territory, it is not surprising that he does not have a chance to put down any roots. Regarding the territory he covers, a few times he is asked/hired to head to a trouble spot to take care of a crisis brewing but even more often he is just in the right place at the wrong time (for the bad guys). 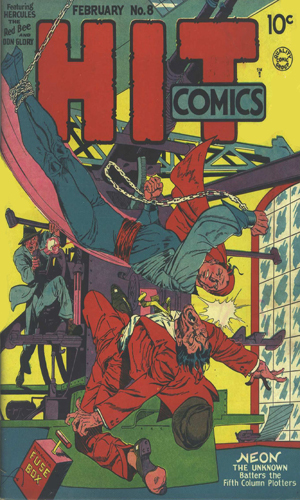 In the summer of 1940, Will Eisner presented a youngish action hero going up against enemy agents from fictitious countries, operating mostly in the Western Hemisphere. He chose as his penname 'Cory Weyt' and he named the operative X-5 with the sub-title "Secret Agent". That got altered to "Super Agent" after the second adventure. X-5 did not stay around long, though, lasting but 4 recorded missions. The month after X-5 was last seen, a new adventurer arrived. "G-5" was his moniker and he used the "Super Agent" from the beginning. For this "new" man-of-action, the creator chose a different penname but did not exactly strain his imagination when he just added a 'e' to the end of the last name. Now, there are numerous similarities between the two heroes. Both were blonds and both loved action and both operated alone. Both also had a mustache. X-5, though, was drawn as a fairly young man, his hair was always swept back, and he sported a pencil-thin mustache. G-5 was a fair amount older by the looks of him, his hair was wavy with often a lock falling over his forehead, and his mustache was full-bodied. The most telling difference in the stories, though, was that G-5 was where the action really was fighting real opponents like Axis soldiers and Gestapo agents. The air was decidedly more hostile and unforgiving and most definitely grittier. 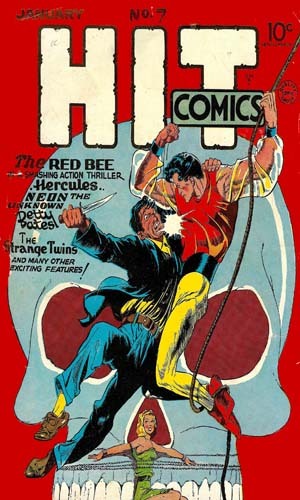 From Hit Comics #5 - In Quanalla, a small Central American country, the rebels must get arms to fight the repressive regime but the ship carrying the needed munitions do not know where to take them. The rebels ask G-5 to get word to the ship. 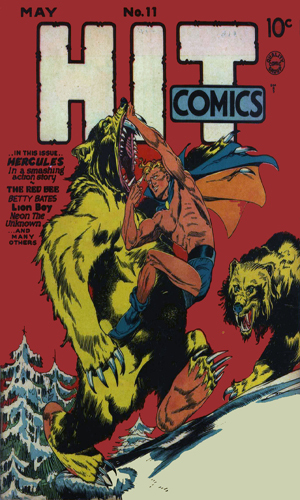 From Hit Comics #7 - A German agent steals from America plans for a new gun site. G-5 heads to Europe to get it back. 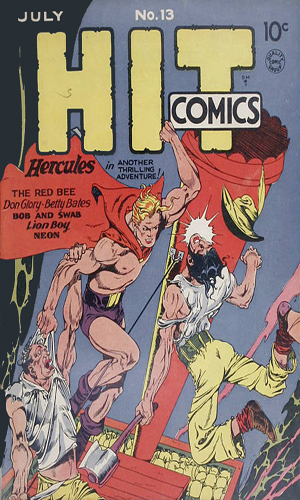 From Hit Comics #8 - A British airplane carrier is missing and the Navy asks G-5 for help. Word comes it is in the Malay area and he heads there to find it. 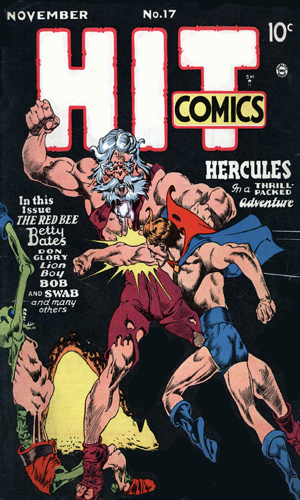 From Hit Comics #9 - In London visiting a friend in British Intelligence, G-5 witnesses another man stealing a capsule worn around the neck of his friend. From Hit Comics #10 - In the Basque region of the Pyrenees, G-5 takes the role of an itinerant worker and gets a temp job on a fishing boat. He learns some of the boats are manned by German spies. 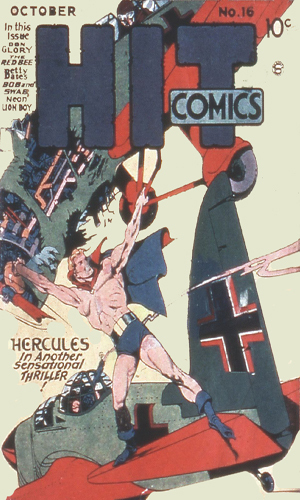 From Hit Comics #11 - G-5 was impersonating a German pilot when he was shot down off the coast. Needing to get to London, he and his driver get lost and stumble on a German spy ring in a graveyard. 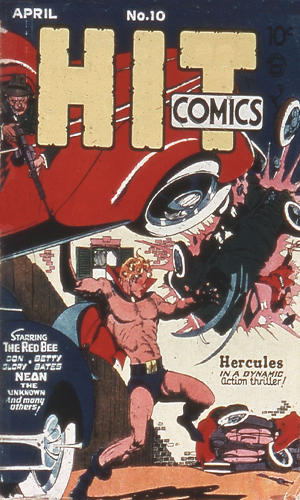 From Hit Comics #12 - G-5 is in Paris checking out how the German invaders are fairing when he ends up helping a small band of resistance fighters. 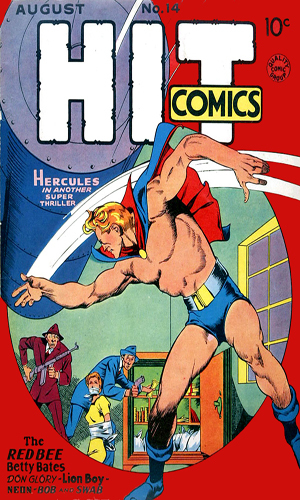 From Hit Comics #13 - The American Embassy asks G-5 to take pictures of some would-be visitors to the U.S. as they are suspected of being Axis spies. They react strongly to his taking the snapshots. From Hit Comics #14 - The French in Algeria ask G-5 to help find a Gestapo spy ring out to force the French out of the North African nation. 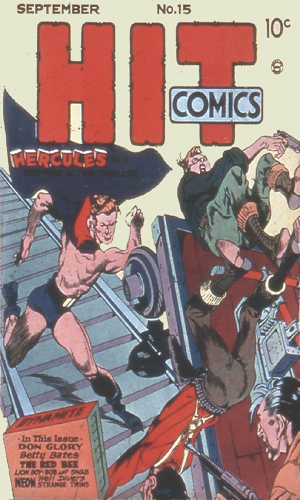 From Hit Comics #15 - On a merchant vessel bound for the U.S. G-5 learns of a plan to use the ships own fuel to resupply a U-Boat. 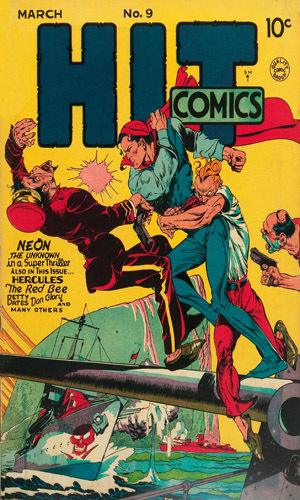 From Hit Comics #16 - Enemy agents have blown up an American destroyer off Rio and G-5 decides he needs to investigate. His troubles start the minute he boards a plane. 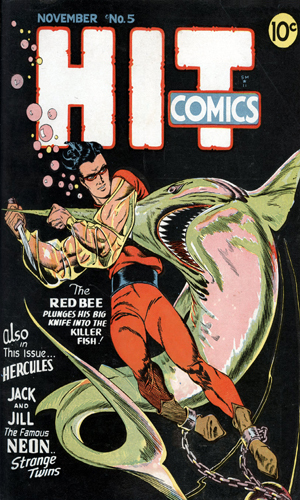 From Hit Comics #17 - G-5 learns of a plot to kill a visiting diplomat using poison on roses and decides to stop it. For being able to tell a short story in four pages of usually nine cels each, the author, Will Eisner, aka Cory Weyte, was a true master. Of course, that small a space definitely kept the reader from learning anything about the character's history or personality but that was never the intent. Action was, as well as being able to show just how awful the nasty guys G-5 faced really were. 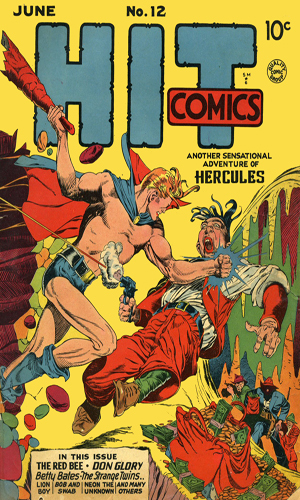 Mentioned above, the feel of the stories in the G-5 adventures were a good deal grittier and more realistic, bringing to the American comic book reader a better feeling of the fight that was really going on "over there". Cory Weyt/Weyte, aka Will Eisner, created two "super agents", X-5 and G-5. They were very much alike and quite a bit different. One was most likely American and the other probably British, though neither were explicitly so marked. They fought different enemies in different parts of the world but they were both entertaining, if not unfortunately both fairly forgettable. I wonder if these two heroes might not have been distantly related. After all, they did share the same last number.